I’m not going to lie to you- looking at the color of wine isn’t exactly the sexiest topic. Normally, when I start to cover this in my tours people glaze over. I can’t lie - it amuses me a bit. I ask everyone to start examining the color of their wine and I get a few looks that tell me that they all think I have 20 heads, and that they are now dreading the next two hours. It’s cool- I win them back later on. The color of wine will tell you a lot. I like to think that the color of the wine is the secret holder of the wine. The nose is extremely important and of course so is the palate, both of which we’ll talk about, but the color is the best lead in. It gives subtle clues to the type of grape, and even the age of the wine. Every grape varietal (or, you know, type) has it’s own DNA. That DNA will affect multiple facets, such as the climate it’s happiest growing in or the thickness of the skin. This DNA affects multiple aspects of the wine, but the first, of course, is the color. So let’s get to it. Here’s the thing - there’s a right way to look at wine, and a wrong way. You know when you’re out to dinner at a nice place, and across the room you see a fellow diner hold his wine glass up to the light, critically inspect it, and immediately make a big show about swirling and sipping the wine? We’ve all seen him, and as much as we’ve wanted to roll our eyes at him, a part of us has thought- well he must know what he’s doing. Let me tell you for once and for all, if he’s holding that glass above his head and staring into the chandelier light- please go ahead roll your eyes. I’m definitely rolling mine. The best way to look at your wine to properly view the color is to tip your glass, carefully, to a 40 to 45 degree angle, over something white. This could be the tablecloth, a plate, napkin, a white sheet of paper you carry especially for this purpose…oh is that just me? 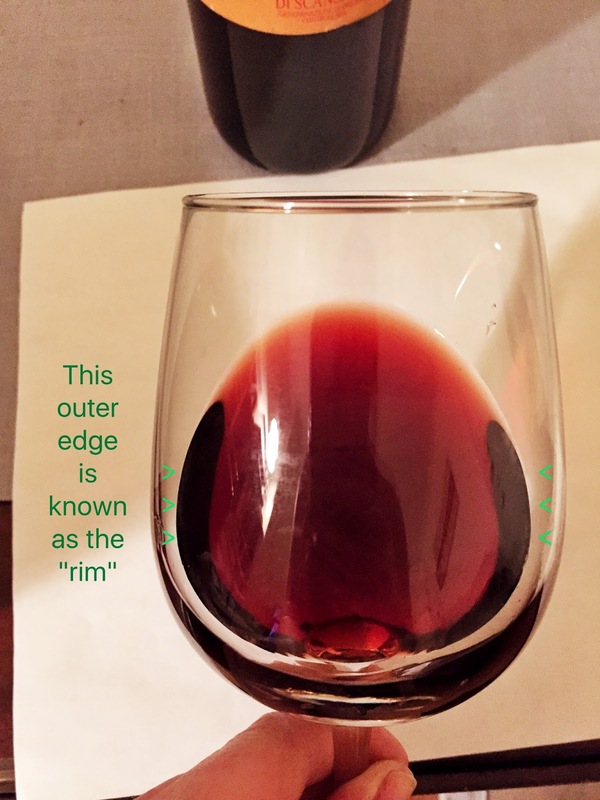 Moving on…Once the glass is tipped correctly, then look to what’s known as the “rim”. The rim is the edge of the sides of the wine. So where the wine volume is thin. Here look at the color. White wines that are young in age will be a light yellow, maybe like straw, and may show signs of green. As those wines get older, that green will become less and less, and the yellow will start to turn more golden and then start showing more and more soft brown notes. A well aged white wine will take on the color of amber. Red wine behaves very similarly- a young red however will show bright blue in the rim which will fade as it matures. Here, again, brown notes will creep in and we’ll hedge towards the color tawny when we have significant aging. I realize I’m writing in generalities when it comes to how many years it takes for those colors to fade or deepen. Unfortunately that’s on purpose. This is not an exact science. Every wine will age differently and on their own timeline, but typically the first year or two of the vintage will show the green or blue notes, the following stage will remain for the next couple of years after that but each year will bring more and more brown tones to the color. The other piece that we’re looking at in that glass is the depth of pigment. Now this is harder to see in white wine, but in red - when you’re tipping your glass can you see through the center of the liquid? This gets a bit more advanced but the different concentrations of pigments indicates the type of grape. Pinot Noir is easy to see through, whereas Cabernet Sauvignon is much more difficult. I have to admit, I am not a wine expert at all. But, I also thought the color had to do with how long the wine comes in contact with the skins and that the oak can also make colors lighter or darker. Great question Jason!! You're right - the depth of color is absolutely an indicator of the grape variety and we'll definitely talk about that here in future posts -but I wanted to keep this concentrated for now on simply the color spectrum. Thanks for reading!! Where does the blue come from? I wouldn't have expected that at all.